With the abbreviated 2012-13 NHL season in the books, many trading card collectors and hockey fans alike have been eagerly anticipating the start of the 2013-14 season. Fans were not only excited to get a full season underway, but also because it gave the trading card world the unique position of offering a Double Rookie Class to NHL collectors. 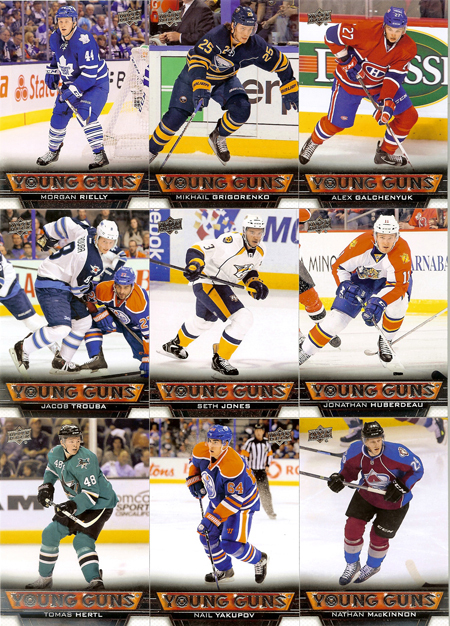 And today is the day hockey fans can get their first opportunity to experience opening Upper Deck’s flagship NHL brand and pull “Young Guns” rookie cards featuring the best rookies over the last two years. Since rookie cards are a huge driver for NHL trading card sales, demand for the product both from consumers and dealers has far exceeded expectations and shops are reporting record setting numbers for 2013-14 NHL Upper Deck Series One already. Upper Deck was prepared for heightened demand for this release, but the demand has been so significant that earlier this week the company announced a sell out on 2013-14 NHL Upper Deck Series One. 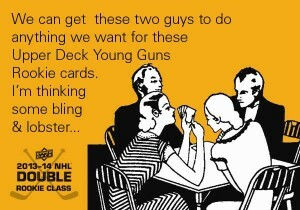 The product is truly a collectible that hockey fans everywhere will be looking to collect for years to come. Order a box today!